Every coffee roaster will bang on about quality – all the things they do to achieve quality will be eloquently written in how their coffee tastes better, is fresher or because it is “hand-roasted” they can control it better. For any experience coffee roaster, those explanations do not translate into quality as they are just smoke and mirrors marketing fluff. Personally speaking, many of my friends that are co-incidentally also coffee roasters – despite all of us operating within a cut-throat competitive industry, there is also a fair degree of camaraderie. Many of the roasteries I have visited over the years have almost zero, if minimal quality control systems, practices or processes – in fact it is so rare to see, except in the really big companies. 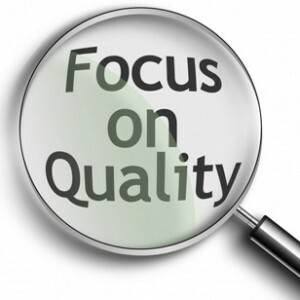 Generally speaking, the larger the company, the more significant the quality control systems. However, having elaborate quality control systems does not directly translate into better tasting coffee, it just means it will be more consistent. It can also be truthfully stated that larger coffee companies purchase cheaper and lower grade raw coffees to support their business objectives and because better tasting coffee may not be their primary marketing target – it could be volume and price. In the Australian market, for most coffee roasting companies it is the person roasting the coffee who has been assigned the role of QC controller. It sort of makes sense actually because they are the ones who can control it the most. If a coffee company expresses “that they really care” then that statement in itself is not a quality system. Caring, or taking pride in your product is just a single step on the quality highway. Caring means you might have pride that what you are producing is good. If you have ever watched episodes of Gordon Ramsay excellent reality TV show Kitchen Nightmares, then you know first hand how delusional people, especially owners and those creating products, can end up if they believe their own bulls**t.
Unfortunately, with so many new roasters now entering the Australian industry, many are starting their businesses and careers with limited capital investments, barely enough scraped money to purchase a basic roasting machine and nothing left in the budget for quality. These new so-called “specialty roasters” are operating on the smell of an oily rag – mostly without basic operational requirements of a de-stoner, pollution control or calibrated packaging systems – everything is performed by hand which as we all know is prone to considerable variances and quality issues. The romantic notion of the new coffee roaster starting up, unbelievable enthusiasm, can-do attitude, self-belief that they can do anything……these are the key danger signs of a business without a quality system. Many of the new roasting companies will talk about how their coffee is precision roasted to defined profiles. The reality is most of them are using cheap monitoring tools that perform simple or basic data logging of polled results – no adjusting or allowing for changes during the roast batch cycle as their roasting equipment is manually (hand) controlled. These cheap monitoring tools are nothing more than a low cost multimeter and a temperature probe hooked up to a notebook computer. It’s not a quality system, just an electronic display and record keeping system. When dealing with a coffee roasting company – ask yourself – where is the quality and consistency – Is it the equipment, is it their knowledge or experience ? At Carlini Coffee Company, our roaster is a qualified Engineer, trained at one of Australia’s largest manufacturing companies. The indoctrination of quality was a constant and pervasive topic for 25+ years. A quality system to us is something that spans the disciplines of sourcing raw coffee, the conditions under which we store our raw coffee before roasting, the methods used to roast, degas and pack, storage and transportation until the end brewing specifications of the finished product. Everything is in a loop. ISO certification is a respectable achievement and whilst we would not suggest anything negative about ISO programs, we do firmly believe that certification programs such as ISO apply constraints and restrictions on flexibility in dealing with the requirements of a dynamic and evolving coffee industry. For this reason, we have not pursued ISO accreditation – having experienced ISO in other industries and seen first-hand how it limits the ability to cope with constantly changing and evolving customer or raw ingredients requirements – adding cost structure layers, reducing flexibility and customer focus, introducing unnecessary time delays and considerable efforts to manage non-conformance. Agility and accreditation are forces in tension (of course, advocates of structured quality systems would disagree). ISO cannot deal with the fact that raw coffee is highly inconsistent and customers are constantly changing their minds. An example is this:- we have cafe customers who get bored with great coffee after a few weeks. So, their palate gets tired and they need a change. What do you think they do……..they tell us to change the coffee blends to suit a different target or objective. It’s done at a whim, not for any reason or fault of the coffee – how would the ISO process deal with that ? We order new coffees EVERY week – these are tested on our own roasters using real-world evaluations that are both scientific (lab) and practical (in the cafe). We do not trust coffee roasted by others and therefore do not evaluate roasted samples from brokers. We buy more new coffees than any other Australian coffee roasting company. We do not buy a particular coffee because it has a fancy descriptor or gushing metaphors written by someone with a talent for marketing. We trust only our own roasting and cupping – this is what determines our green bean commitments – rave reviews and over-hyped descriptions belong elsewhere. Blending is a developed skill that requires considerable effort – you just can’t throw beans into a mix. Getting the best from a blend is a constantly evolving practice – testing, feedback, adjustment, etc. We are not afraid to “break the rules” of blending in order to achieve excellence. We know that many new roasters entering the market lack the essential blending skills to produce a consistent product over a period of time. Our computer system roast profiles are constantly reviewed and adjusted to suit the types of coffees that are being imported into Australia and the changing palates of the coffee consumer. Temperature stability and environmental conditions need to be compensated during the variable weather patterns we experience in Melbourne – wind, humidity, ambient temperature, duty cycle, airflow – all these are scientific factors that the “hand roasted” crew just cannot easily cope with and why they cannot achieve perfect consistency. Seasonal crop differences mean that in general terms, any of the beans in stock are at best a 3 month proposition – allowing for tapering of previous and current season. This relatively small window means nothing ever stays the same for very long and to manage consistency we plan the tapering process over a longer period of time to minimize major differences that can arise at change of season. Over the last 9 years we have developed a collection of proprietary automation tools that remove variability from our coffee roasting manufacturing. These tools are used to assist in the forecasting, modelling for capacity planning, scheduling of roasting sequencing, identification of work in progress and dispatch management. We use these tools to plan each week and day’s production to ensure we meet the growing and flexible demands required by Contract and Private Label customers. We have a solid Beta Program involving a 10+ high-end cafes that act as our extended testers for new coffees. These are owned or staffed by exceptionally talented baristas who provide honest, robust feedback on the performance of our new trial/evaluation coffees. If a coffee passes the test of our beta group, it gets a gig as a staple in our line-up. Without doubt, this collaborative approach is our most valuable feedback loop on quality and performance.